So, I’m fifteen and a half. Marguerite Duras (1914-1996) says she’s written a good deal about the members of her family, “but then they were still alive, my mother and my brothers. And I skirted around them, skirted around all these things without really tackling them” (Duras 2008). Well she makes up for this oversight in The Lover, arguably her most successful book, first published in 1984, translated into more than forty languages, and winner of the Prix Goncourt, France’s most prestigious literary prize. The Lover is informed by memories of Duras’s youth spent in French colonial Indochina, now Vietnam. Born in 1914 just outside Saigon, she and her two older brothers were bound in poverty and unhappiness. 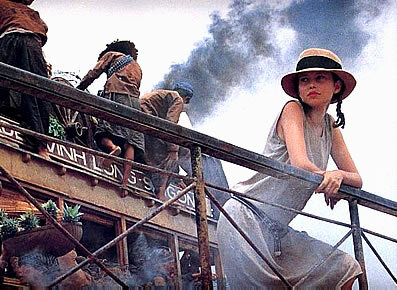 With their father long dead, their mother, whom Marguerite loved, pitied and disliked in equal measure, tried to eke out a living as a head mistress and farmer in and around the Mekong River. The book recalls an illicit love affair lived by the 15-year-old Duras with a wealthy Chinese man almost twice her age in the late 1920s. It is couched from beginning to end in nostalgia: for beauty, love, youth and family. The Lover is a record, a partial memoir, a meditation, an interrogation of memory as told by Duras of select events and emotions from her own life some 55 years after they took place, when she is an old woman with a “face laid waste” and a mind and body ravaged by alcohol. It is not a morbid or melancholic read. Rather, it is a “small, perfect novel [that finds] a felicitous and masterly balance between formalism and powerful emotional effect” (Johnson, 1985). However, as real and as sincere and as confessional as it reads, you’re unlikely to find The Lover in the autobiography or non-fiction section of book stores or libraries, because in those locations, as well as with Amazon.com, it is generally classified as literary fiction. A more accurate definition might be the oxymoronic ‘autofiction’. If the reader prefers, this book may be regarded as fiction. But there is always the chance that such a book of fiction may throw some light on what has been written as fact (1966). It’s not the shoes, though, that make the girl look so strangely, so weirdly dressed. No, it’s the fact she’s wearing a man’s flat-brimmed hat, a brownish-pink fedora with a broad black ribbon. The crucial ambiguity lies in the hat. How I came by it I’ve forgotten. I can’t think who could have given it to me. It must have been my mother who bought it for me, because I asked her. You’d think this zig-zag effect could make for an uneven, disjointed narrative. This is not the case. Duras is able to ensure such shifts appear seamless by often retaining the same item or idea as she moves between first and third person (and past and present tense), sometimes within the same paragraph. In the excerpt immediately above, it’s the reference to the hat that’s common even though each is spoken from a different perspective. There is even the occasional lapse into second person. But in the main, the predominant use of third person narrative is one of the prime fictional devices Duras employs in building the illusion of a detached but close third person/limited narrator. This has the subtle effect of placing the reader in a no man’s land between truth and fiction, where memory is stroked and cajoled by longing. The simplest way to tell a story is to start at the beginning and progress to the end. Through time-shift however, “narrative avoids presenting life as just one damn thing after another, and allows us to make connections of causality and irony between widely separated events” (Lodge, 1992). The Lover begins and ends in old age but uses the incident of Duras’s teenage affair to ground the semblance of a plot while the narrator selectively careens back and forth across more than half a century of desire, regrets, emotions and recollections. The refusal to occupy a fixed place or space and the anxious search for wholeness or identity informs much of Duras’s more mature writing, according to Margaronis (1986). While certain themes persist – remembering, forgetting, desiring and crossing boundaries – “the swing between past and present is an intangible that Duras aims to conjure up for her reader”. As she continually weaves and unravels her story, Duras “spins an invisible thread of memory and desire at the borders and in the gaps of traditional narrative modes” (Brosman, 1989). And Duras did not confine this time-shifting device to prose writing. Twenty five years before The Lover, her screenplay for Hiroshima mon amour (nominated for a screenwriting Oscar) caused a critical storm at Cannes in 1959. The story of a public and private tragedy, intertwined and played out in remembering and forgetting sequences, but with time shifts and radical jump cuts, supposedly scandalised some moviegoers for what was perceived to be a diminishing of Hiroshima’s tragedy. The film won a BAFTA for Best Director and also the New York Film Critics Circle Awards for Best Foreign Language Film in 1961. I used to watch what he did with me, how he used me, and I’d never thought anyone could act like that, he acted beyond my hope and in accordance with my body’s destiny (Duras, 2008). It is this austere approach to language across multiple narrative modes that contributed to Duras and in particular, The Lover, being labeled a nouveau roman (or new novel) by French theorists, who are always quick to invent or attach a theory to literary innovators. The ideal nouveau roman would place less emphasis on plot, action and character, and “eschew metaphor and simile in favour of precise physical descriptions, a heightened sense of ambiguity with regards to point of view and radical disjunctions of time and space” (Cuddon, 1999). Duras also evokes a wonderful sense of place, albeit sparingly. This is helped of course by the exotic colonial setting: “There are no seasons in that part of the world, we have just the one season, hot, monotonous, we’re in the long hot girdle of the earth, with no spring, no renewal” (Duras, 2008). This notion of the ‘exotic’ that Duras uses in moderation but to great effect – the setting of which is so far removed from the world of her European readership – helps contribute to the book’s fictional feel with its allusion to an “‘abroad’ for an audience assumed to be located at ‘home’” (White, 2008). Weather also plays its part in alluding to the ‘foreign’, this other ‘place’, especially when used with subtlety and discretion, as Duras does. “It is a rhetorical device capable of moving and powerful effects, without which fiction would be much the poorer” (Lodge, 1992). Dusk fell at the same time all the year round … In the rainy season, for weeks on end, you couldn’t see the sky, it was full of an unvarying mist, which even the light of the moon couldn’t pierce” (Duras, 2008). Another rhetorical device used fleetingly by Duras that can also enrich fiction is synecdoche, in which parts stand for the whole. Description in fiction is necessarily selective, suggests Lodge (1992); whatever detail the author chooses in a particular scene “constitute a minute proportion of all those that might have been noted”. When it comes to colonial wives, Duras is less than impressed, but she hones in on select elements to convey her wider disdain: “They don’t do anything, just save themselves up … when at last they’ll be able to talk about what it’s like here … They wait these women. They dress just for the sake of dressing. They look at themselves … they already have huge wardrobes full of more dresses than they know what to do with”. This repetition, rather than reading as overdone, helps build a degree of tension as more detail is added teasingly to each mention of the scene on the ferry; her physical description; a mysterious black limousine; a reference to her mother’s financial predicament. It’s as if Duras might be saying: ‘there’s something momentous at the end of this. So stay with me’. While novelistic techniques can generate the excitement, intensity and emotive power of fiction, it’s the guarantee that the story is essentially true that gives The Lover a compulsion that no fiction can quite equal. As if to emphasis the factual nature of the events recounted, the author ‘signs off’ the manuscript with a reference to the time and place it was compiled: Neauphle-le-Château, Paris, February-May, 1984. In juxtaposing biographical and fictitious elements within shifting time frames and questioning the reliability of recall, Duras nonetheless challenged the boundaries between fact and fiction; between self and other; between longing and loathing. This is The Lover. This is what autofiction might feel and read like. Brosman, Catherine (1989), ‘Dictionary of Literary Biography, Volume 83: French Novelists since 1960’, Tulane University. Cuddon, J.A. (1999). ‘Dictionary of Literary Terms and Literary Theory’, Penguin, London. Duras, Marguerite (2008), ‘The Lover’, Perennial Harper, London. Hemingway, Ernest (1966), ‘A Moveable Feast’, Penguin, London. Lodge, David (1992), ‘The Art of Fiction’, Penguin, London. Margaronis, Maria (1986), ‘The Nation’, in The Occupying Passion, New York. White, Edmund (2008), ‘In Love with Duras,’ in The New York Review of Books, (accessed April, 2009).